But What is Omega 3? Foods high in Omega 3 are both delicious and easy to find. Using Omega 3 sources, whether from diet or supplements, may significantly improve your wellness. Foods high in Omega 3 may be a recent nutritional buzzword. There is good reason for this. While Omega 3 is an essential fatty acid and is obviously very good for you, knowing exactly what is Omega 3 may get you craving some of the foods containing it. Omega 3 is an essential fatty acid needed by the body, but the body cannot manufacture its own. 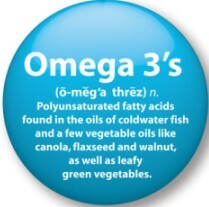 It is a “good fat.” Omega 3 is different from both Omega 6 and Omega 9 fatty acids. The wellness benefits of Omega 3 are rich and varied. Diets rich in Omega 3 has been shown to positively affect various aspects of your health. Although Omega 3 is usually linked to good heart health, heart benefits may be just the start of the many health benefits of Omega 3. Does Omega 3 Help Depression? Omega 3 for depression may be one of the many benefits of Omega 3. The Omega 3 fatty acids are important in the cell membranes of nerve cells and the phosolipids that compose most of the brain cells. A diet rich in Omega 3 fatty acids may help to improve the health of brain cells by enhancing nerve cell communication. Depression is a common mental illness with many different causes such as genetics, drug use including some prescription drugs, alcohol and the individual’s environment. However, supplementing your diet with Omega 3 may help alleviate some of the symptoms of depression. A table complied by the Psych Education organization shows the outcomes of several studies of Omega 3 and depression. Although Omega 3 supplements are probably not the sole treatment of depression, they may help in some cases. What Foods Contain Omega 3 Oil? Here is a list of foods high in Omega 3. Reading this list is only the start of your good health. Take this list grocery shopping or put it in your kitchen to remind you to eat foods containing Omega 3 every day. Fish of all types. Some excellent suggestions include: Salmon, mackerel, albacore tuna, anchovies, sardines, trout, bluefish, sword fish and herring. Eggs – Search for free range eggs, preferably from a local farmer to get the highest concentration of Omegas 3 while not affecting your cholesterol. Walnuts – Go ahead and dip them in dark chocolate if you like! Grind them fresh or take a flax seed oil supplement daily. Eat foods high in Omega 3 raw or very minimally processed. Rice E - This product contains over 100 different antioxidants. It is also an Omega 3 and 6 supplement. Essential Living Oils - This balanced blend of EFAs is a superior supplement of Omega 3, 6 and 9. These plant-derived oils are perfect for vegans too.